It’s no secret that we love mixing our yarns that are chock full of trims with our simpler Sister yarn. 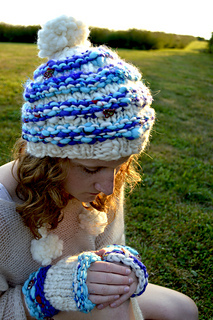 Sister yarn is a lightly spun thick and thin yarn that comes in giant 215 gram skeins. When Sister is striped with our embellished yarns, like Gypsy Garden or Rolling Stone, it helps stretch them out to make the most of their gorgeousness. That’s what we hope we’ve done here with this matching hat and glove combo. 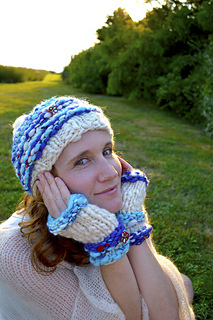 You’ll just need 2 skeins to make this set. 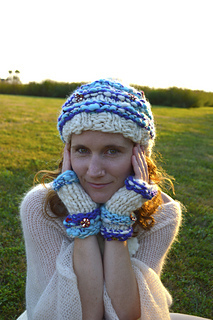 This hat and glove combo are perfect for a holiday gift for someone special. 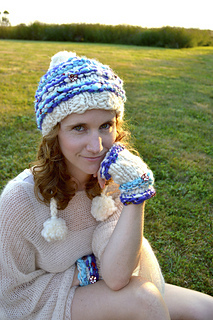 We especially love the slouched hoodie hat shape, snug fingerless gloves and mixed garter stitch stripe. 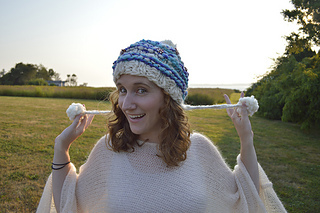 Needle Size: 16” long size 13 circular needles, 16” size 15” circulars, size 15 double pointed needles.